It is one of the most conspicuous brain structures in humans. It is the most prominent and deepest section of the cortical sulci. It is one of the sulci that develop earliest in the human brain. It appears first around the 14th gestational week. This indentation was first painted in an accurate manner in 1600 by Girolamo Fabrici d’Acquapendente. The discovery of this structure is attributed to Franciscus Sylvius. The groove is named after this Dutch scientist and physician. It appears as an indentation or large deep grove. Although present in both brain hemispheres, it is found to be longer in the left hemisphere. The structure comprises of many side branches. It is situated close to the Sylvian point, the spot of the human skull located in a 30 mm posterior position to the Zygomatic process of frontal bone and nearest to the Sylvian fissure. Lateral sulcus plays a vital role in the diagnosis of Schizophrenia disease. It has been observed during the examination of the disease that there is a considerable difference in the length of the lateral sulcus that is found bordering the planum temporal. The planum temporal is a region of the brain that is associated with the linguistic functions. The cognitive impairment exhibits a diffused pattern in the patients suffering from the disease. In female patients suffering from the disease, an atypical pattern of anatomical lateral symmetry is observed, which is considered as a better cognitive condition in the schizophrenia patients. The organ is also associated with brain tumours. The symptoms of the disease include epilepsy, depression, headache, drowsiness, vision disorder, hearing issues, mental disorders, etc. The condition of the lateral sulcus while patients are suffering from brain tumours can be examined through magnetic resonance. The treatments that work in controlling brain tumour include chemotherapy and radiation. 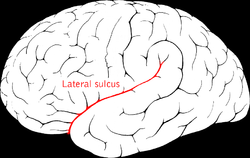 Go over these useful images of Lateral sulcus to know how this brain structure appears to view.